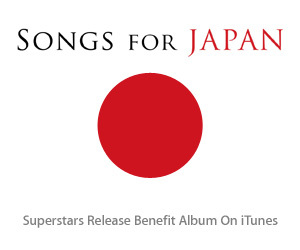 As Japan recovers from the devastating earthquake and tsunami that struck on March 11, the world’s top recording artists respond to the tragedy with this benefit album. The 38 tracks include some of their biggest hits, featuring an exclusive remix of Lady GaGa’s “Born This Way,” Katy Perry’s “Thinking of You,” Bruno Mars’ “Talking to the Moon,” Adele’s “Make You Feel My Love," and more. All proceeds go to the Japanese Red Cross. John Fratelli Live at the Royal Albert Hall and debut solo single "Santo Domingo"
Jonathan Jeremiah. March 21st release of debut album “A Solitary Man”. Jonathan Jeremiah, whose timeless songs and soulful voice have marked him out as a songwriter with a rare talent, introduces himself with the release on March 21st of his debut album “A Solitary Man”. Jonathan recently appeared on Later With Jools a full five months ahead of the album release giving a stunning solo acoustic performance of one of the album’s many standouts “How Half-Heartedly We Behave”. Jonathan has just completed a month long residency at the Borderline following his recent special guest appearance with Rumer at her sell-out Bloomsbury Theatre show. The album was produced and engineered by Jonathan in an analogue studio in Dollis Hill and featured collaborators included The Heritage Orchestra, a young group of classical musicians attuned to his working methods, and Jules Buckley who handled all the string arrangements. Featured tracks on the 11 song album include gorgeous string-drenched single “See”, “Happiness” and “A Solitary Man”, two songs written while travelling across America, the latter inspired by a 90 year old Great Aunt he met in California, future single “Lost” and the soulful stomper ”Heart Of Stone”. Jonathan Jeremiah’s music comes from a world far away from the quick fix, pre packaged production line. The North Londoner has spent the best part of a decade defining a sound rooted in a rich legacy of bespoke English folk and confessional soul. With a deep, naturally dramatic voice, stunningly arranged orchestrations, delicate finger picked guitar and songs that make a lasting impression, Jonathan’s sound is the result of a journey that began with guitar lessons age 6. It has taken in family childhood sing-alongs with his 5 siblings during summer holidays to his mother’s native Tipperary, and progressed through the discovery of influences by listening to his father’s extensive vinyl collection. Artists such as Scott Walker, Cat Stevens, Serge Gainsbourg and John Martyn made a formative and lasting impression. The album was self-produced and self-funded, Jonathan worked nights as a security guard at Wembley Arena to finance the record. “It was important to produce the album myself. If I said to a producer I want a 24 piece orchestra with flugelhorn they would say it can be done on a keyboard. People don’t always have the ability to visualise your idea so you have to do it yourself. Jules knew exactly what I was looking for from day one”. Undoubtedly a major factor in the sound is Jonathans rich sonorous vocal. “When I was 14 my voice developed an incredible deep baritone. At the time it wasn’t the greatest thing, everyone wanted to sound like Jeff Buckley. I felt like a man out of place but in time, I embraced the baritone.” The other significant element is his fluent and luminous guitar, inseparable from the voice. Now after all the searching, the night shifts and the learning from past masters, Jonathan has arrived at an album grounded in the deep wellsprings from where he first charted his course. “I felt I had a duty to keep the music as untouched as it was back then and not be tainted with whatever else was out there.” “A Solitary Man” has been a long time in the making but offers proof that sometimes the best things take time. With equal measures of hard headed determination and careful nurturing, Jonathan’s music is ready to be unveiled. The time to take his songs into your heart and soul is here. DJ Distance is a South East London-based producer who was instrumental in dubstep’s early development. ......... Before picking up Cubase and becoming a producer, he was a fan of heavy and industrial bands like Pantera and Fear Factory. In 2001 he was being drawn to the dark garage sound that was all around him in South London. Tracks by Oris Jay or Wookie on DJ EZ’s Saturday night show on Kiss FM caught his ear. He began to obsessively buy records from Blackmarket and Croydon’s Big Apple Records, on seminal labels like Tempa and Bingo. Attending FWD>> at its inception when the crowd of 15 or 20 consisted almost entirely of producers, Distance soon took to producing himself. He would bring his early tracks to the club and exchange them with the others creating the new sound, like Scuba, Mala, Jay Da Flex, Caspa and Plastician. Distance’s first release was a white label in 2003, then he was the first 12” put out by Hot Flush (Mount Kimbie, Joy Orbison) and went on to release tracks on Pinch’s Tectonic label, and the influential Boka label. Regular bookings at clubs DMZ, FWD>> and Exodus followed. Rinse FM gave him a show (James Blake on his one hour ‘new artists’ section was one discovery). The late great John Peel was one of the first DJs to play Distance’s tracks. Distance was selected by Mary Anne Hobbs to take part in the first seminal ‘Dubstep Warz’ in January 2006 (a show which was credited with breaking dubstep globally). His full length debut (My Demons) came in 2006 on Planet Mu. It won Dubstep Forum’s album of the year. Follow up ‘Repercussions’ in 2008 also came out on Mu. In 2007 he set up his own vinyl label Chestplate (a reference to chest-rattling sub bass). He has collaborated with Skream and Benga separately on anthemic releases. Now in 2011 Distance releases one of his hottest dubs yet in the shape of ‘Falling’. Keeping his heavy-weight subscapes - that sound like the machines from Terminator 2 brawling - he has added a vocal element. The track has received blanket support from the scene’s DJs; Skream, Benga, Hatcha, Cyrus. Hip hop & R&B DJ Swerve on Kiss and MistaJam on 1Xtra have been heating it up further.